We are in full soccer mode as it comes to an end with soccer every day this week! S is now done but had games earlier this week for state qualifier and will just have tryouts in a couple weeks. A is in full swing on day 2 of the USA Cup that started yesterday and will have games through the end of the week and this weekend if they make it to the championships. This means we are crazy busy and snacks and smoothies are in demand this week. 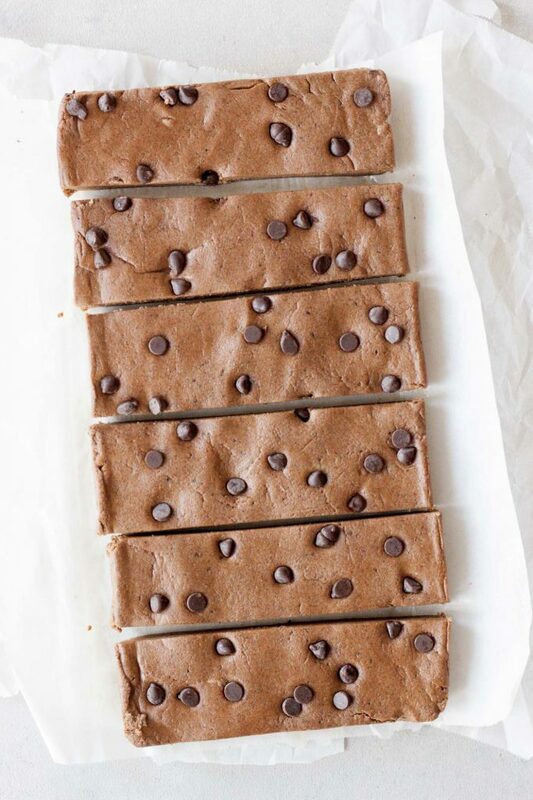 The perfect time to share these Easy PB Protein Bars with you! So easy and delicious and the macros are pretty darn good, yep I included them this time. Not to mention packed with all the goods depending on the protein powder you use. I use Vega Sport and Vega Clean Protein for all the variations we make with them. I was hoping to share these the last two weeks but they were gone as quick as I could make them and I would go to photograph them and they were gone. I got 4 batches made and was finally able to pull off photographing them. Or attempting to although I wasn’t happy with the pictures I don’t want to be the mean mom again making them and telling them not to touch the bars! Not to mention they aren’t the prettiest or fancy and really not sure how I could really jazz up a photo. It’s more about the taste and nutrition with these. 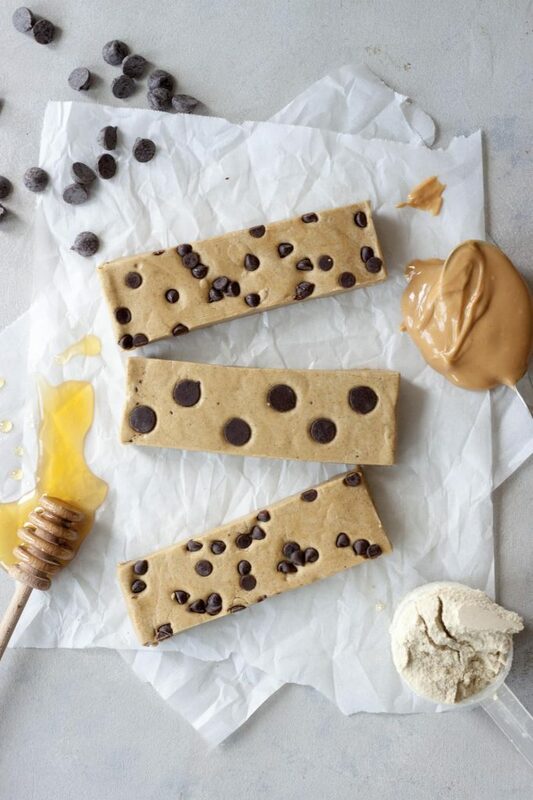 While I didn’t set out to make remake of the Perfect Bar I found out after that they are very similar to the Perfect Bar except that they are gluten free, dairy free, and vegan and paleo friendly. The dairy free is pretty much the only reason I had been avoiding buying them. I did breakdown and buy a Peanut Butter Chocolate Chips that we split apart each trying a bite to see how they compare. A eating the rest since she can have them and she liked it. They are pretty darn close although not quite as dry maybe and there is a little difference as mine are a little more like peanut butter fudge (the peanut butter version) and not as cookie doughy if that makes sense. That’s just my thoughts but they girls thought they were very close. Making them with the Vega protein, we like Clean Protein and Sport Protein, we get add BCAA’s and plant protein which is great post workout without added sugar and when using Sport also probiotics. If it isn’t broke don’t fix it right so I haven’t tried it with others yet but will probably try it with other protein powders like the Navitas Cacao and Greens when it’s back in stock and I can get more since I’d blow through what I have left. If that works out we’d also get in some added greens and superfoods. If you want them to be vegan use maple syrup or even agave in place of the honey. 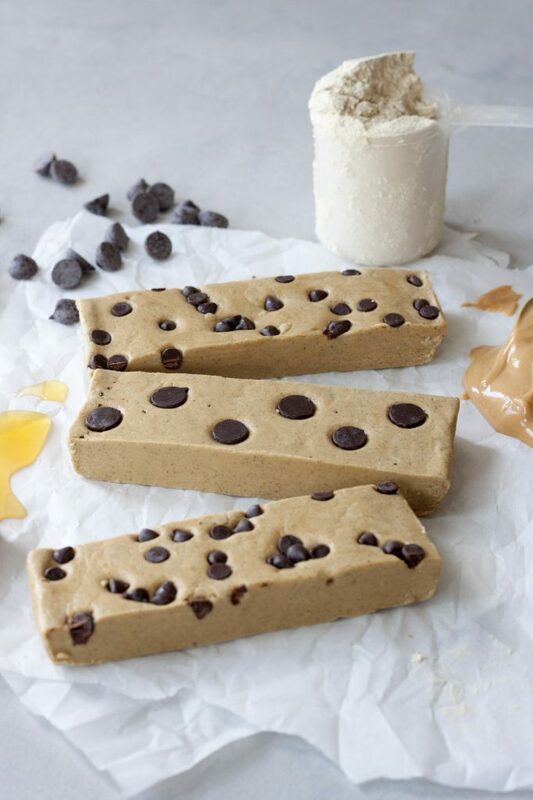 If you don’t want peanuts butter you can also sub almond butter which would make them paleo depending on the protein powder you use (not up on the paleo enough to know if Vega is). I like to play with variations and flavors and we all have our favs. One of the girls likes peanut butter, honey, vanilla protein, and mini chocolate chips. The other likes peanut butter, maple syrup or agave, vanilla protein, and dark chocolate chips. Then I even played since I will have at least 5 barre classes to also fit in this, including a double with a 5:30am class and Intensive longer class yesterday with soccer in between, making an espresso version with Wild Friends Vanilla Espresso Almond Butter, Vega Chocolate Sport, pure maple syrup, and dark chocolate chips. If you’re a regular reader you know that I don’t count calories or macros and don’t include the nutritional breakdown for my recipes. While I use to track my macros I don’t anymore. I’m more about nutrition, balance, and intuitive eating. It does take added time to calculate things out but the biggest piece is that when using substitutions and what you have the nutritional information wouldn’t be the same. I like my creations to inspire others and if you don’t like a berry sub another or if you want almond butter instead of peanut butter use that. In most cases there are substitutions. When it comes to things like sourdough bread and baking many times there aren’t or I don’t test out all of them so can’t guarantee they will work. With this recipe I was very curious to see how it compared to Perfect Bars so I did a little comparison. I did a comparison with peanut butter and almond butter. I used Buddy’s Classic Peanut Butter and Peanut Butter and Company Smooth Operator which were both very close as well as Wild Friends Espresso Almond Butter. Here is the breakdown of the comparison to the Chocolate Chip Peanut Butter Perfect Bar with two of the variations I made. I was actually surprised at how close they came to each other and the comparison to the Perfect Bar. Being so close to each other I didn’t figure out all the other variation combination like peanut butter, maple syrup, and sport protein, and dark chocolate chips since there are so many combinations and variations. Not to mention using other nut butters and protein powders you might use. 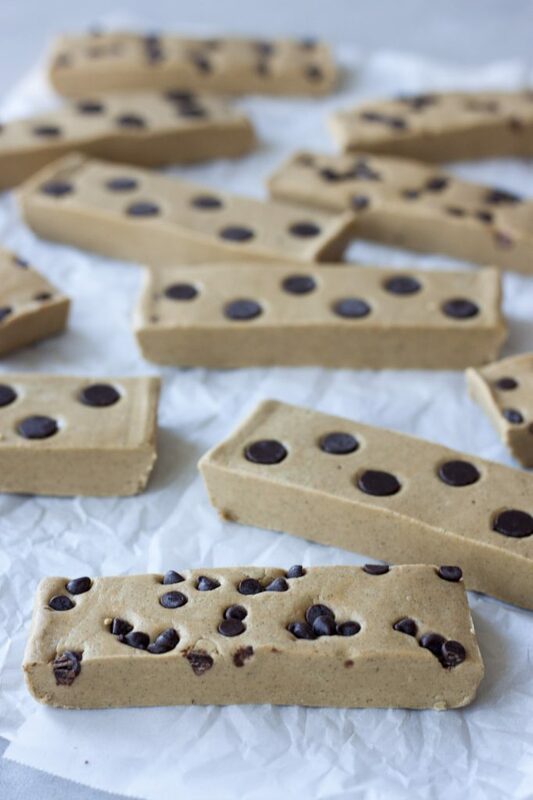 Quick and easy these 4 ingredient Easy PB Protein Bars are delicious plant-based bars that are gluten free, vegan, and paleo friendly! Line a standard 9x5 loaf pan with parchment paper and set aside. In a bowl mix together peanut butter and honey with a spatula until combine. Add in protein powder and mix as much as you can, it will still look like some of the powder is not incorporated. Using your hands knead and mix the rest of the powder in. The mixture will feel like play-doh. Press the mixture into the prepared pan. If you want the top to be nice and smooth you can also place a sheet of parchment paper on top to smooth out or even press another pan on top. 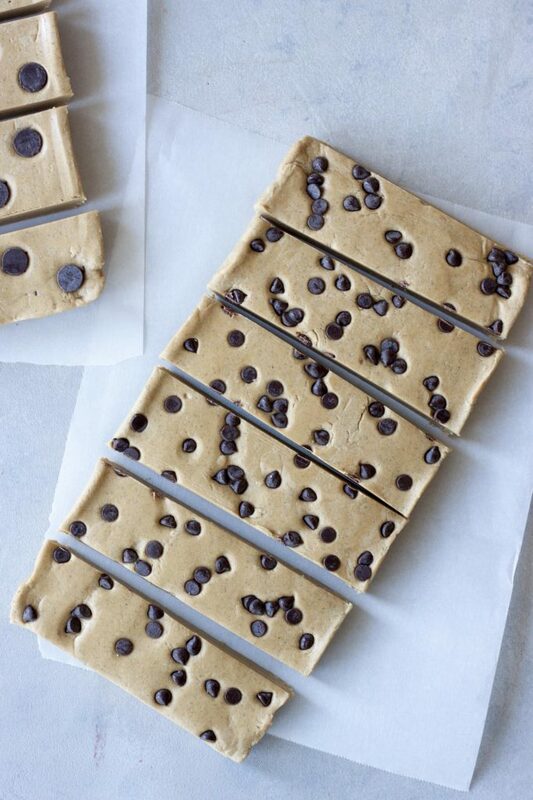 Press chocolate chips into the top. Place in the freezer for 15 minutes to set up. If you don't want to cut or eat them right away you can place the in the refrigerator. Cut bars and place in an airtight container or bag with bars separated with a sheet of parchment paper if stacking them. Store in the refrigerator until ready to enjoy. If taking them on the go they are best slightly chilled so I keep them on ice or they will get too soft. 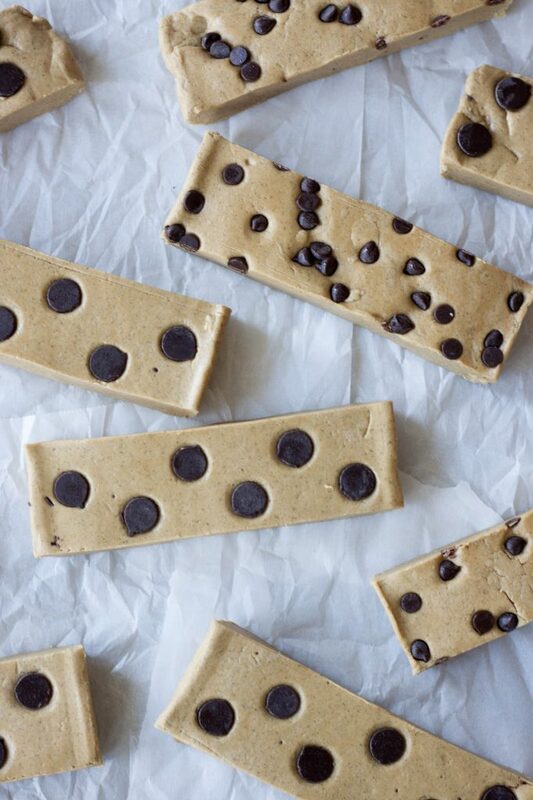 Yay protein bars! Yay for easy! So easy and protein packed!